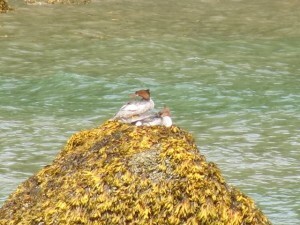 We’re not all about the bears, whales are abundant here too! 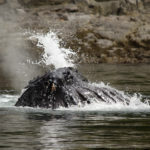 Killer whales and humpback whales are often seen during our wildlife tours. 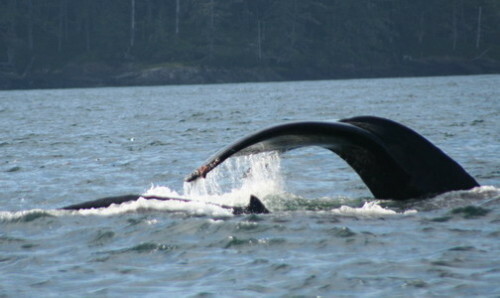 There are resident whales and transient whales that can be seen feeding and playing in our waters. 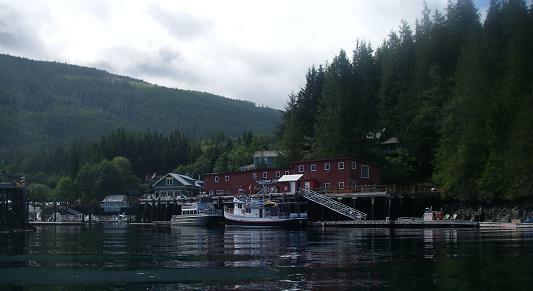 This is the entrance to Telegraph Cove, which is located on Vancouver Island. 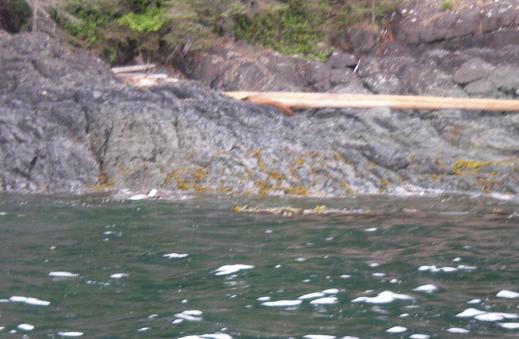 It is two and half-hours north of Campbell River by car over a good paved road. Tour days from the lodge often last eight hours so it is good to have a “civilized” bathroom to use and Telegraph Cove serves that purpose. Also provides a short break from being on the water and possibly a hot coffee, latte or hot chocolate. 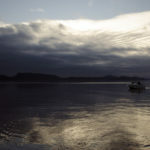 Beautiful morning, with a boat fishing on Johnstone Strait. 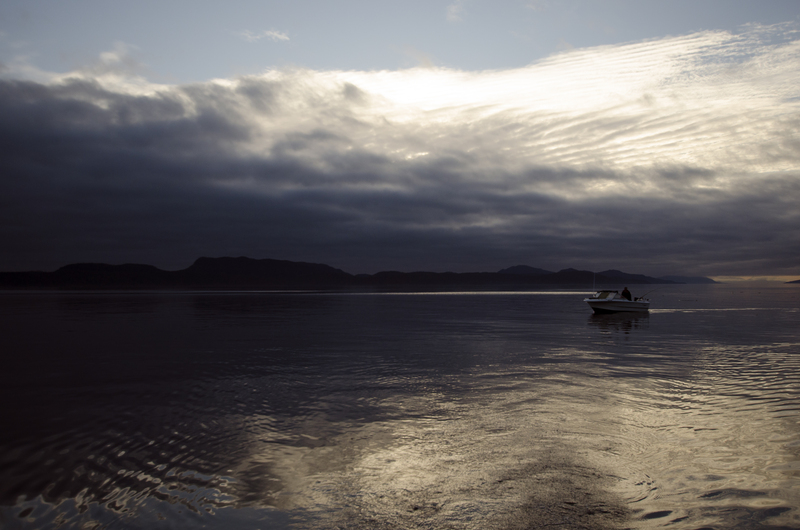 This area is frequented by the Northern Resident Killer whales in the summer, who are after the same thing as this fisherman (salmon). On a day like this its hard to beat it. 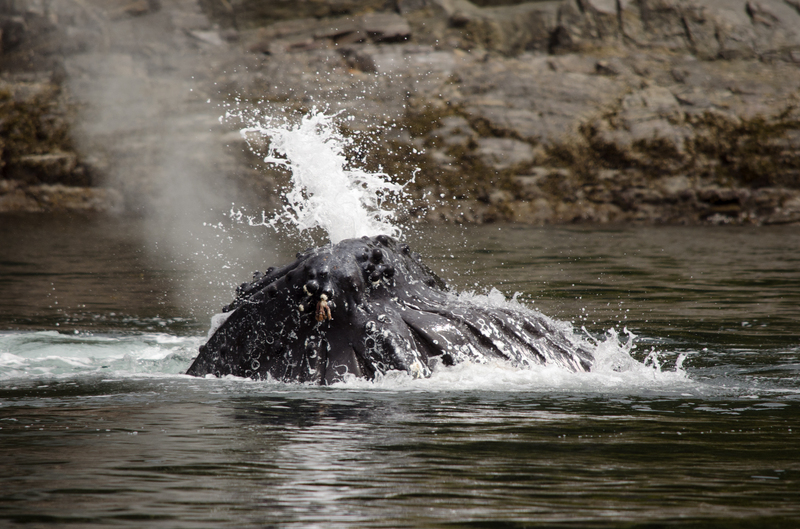 This Humpback Whale has just come up from under a school of baitfish and hopefully got a mouthful of fish. 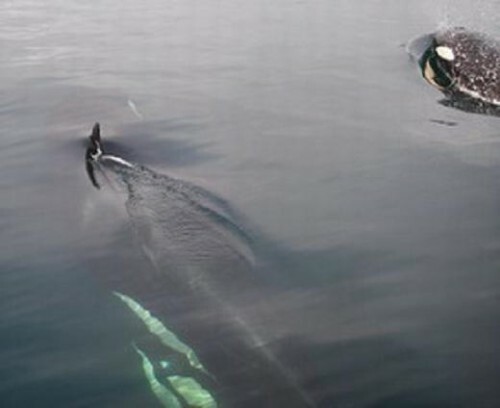 The photo captures the moment that the whale has closed his mouth and forced a burst of water out through his baleen. 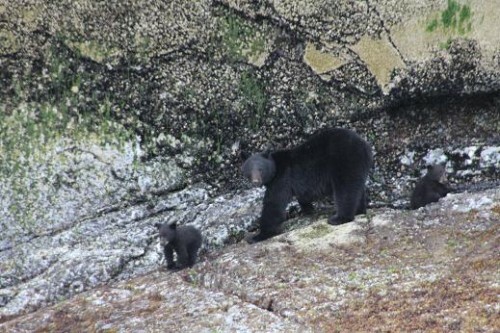 We always keep our eyes open for Black Bears cruising the beaches at low tide. Sometimes it also pays to look up. 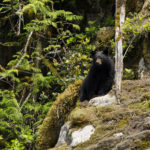 Black Bears are much sleeker then Grizzlies and have short claws, which makes them excellent climbers. 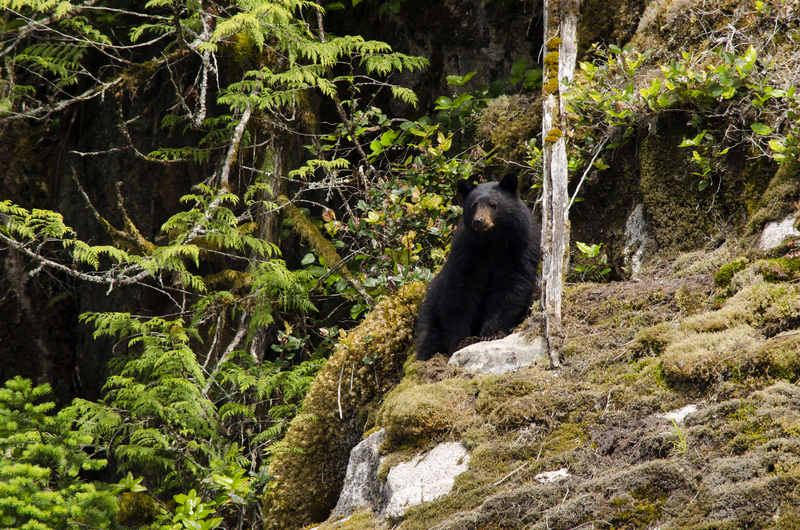 In the late summer there are often salal berries growing on the rocky outcroppings, which the bears enjoy. 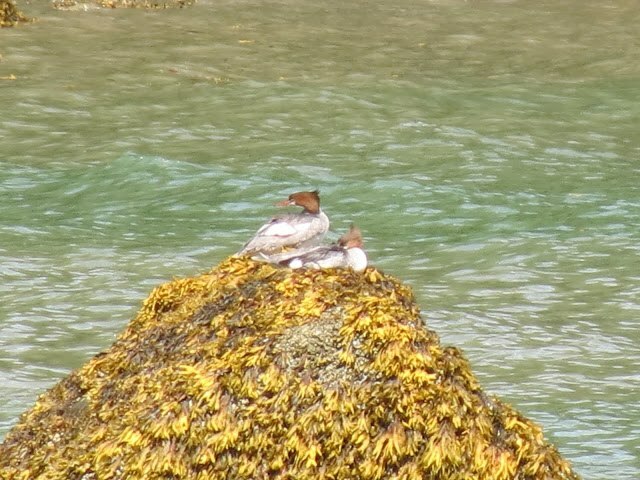 This Common Merganser is an adult female it is a large, heavy-bodied diving duck with a long, slender orange-red bill and a chestnut brown head with white chin patch. The photo was taken in the mouth of the Glendale River were families of these ducks are common in the spring. 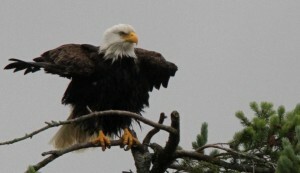 The bald eagles are abundant along the coast and will often hunt ducks. It is interesting to watch the eagles in action. It takes two eagles to constantly dive at the ducks until they tire and spend too much time on the surface were they can be caught by the eagle. 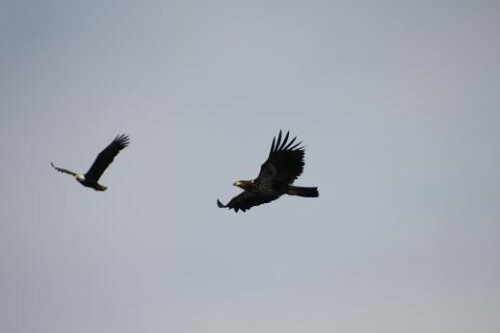 One of our guides and guests saw an eagle catch a blue heron that was not paying attention. 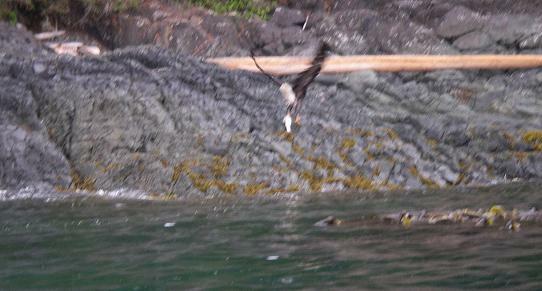 The eagle caught the heron on floating kelp and managed to get it to shore about ten meters (yards) away. Bald eagles can lift up to half their body weight, around 1.8 to 2.3 kg (4 to 5 pounds). Although blue heron are a large bird a national geographic website says that the blue heron is 2.1 to 2.5 kg (4.6 to 7.3 lbs.) so it is possible to lift the heron a short distance.